The M2-F1 lifting body, under tow in 1964, was designed as a means of landing an aircraft horizontally after atmospheric reentry. 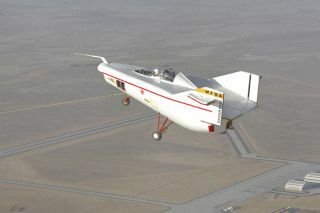 In this historic photo from the U.S. space agency, the M2-F1 lifting body is seen under tow at the Flight Research Center (later redesignated the Dryden Flight Research Center), Edwards, California. The wingless, lifting body aircraft design was initially conceived as a means of landing an aircraft horizontally after atmospheric reentry. The absence of wings would make the extreme heat of re-entry less damaging to the vehicle. In 1962, Dryden management approved a program to build a lightweight, unpowered lifting body as a prototype to flight test the wingless concept. It would look like a "flying bathtub," and was designated the M2-F1, the "M" referring to "manned" and "F" referring to "flight" version. It featured a plywood shell placed over a tubular steel frame crafted at Dryden. Construction was completed in 1963. The first flight tests of the M2-F1 were over Rogers Dry Lake at the end of a tow rope attached to a hopped-up Pontiac convertible driven at speeds up to about 120 mph. These initial tests produced enough flight data about the M2-F1 to proceed with flights behind a NASA C-47 tow plane at greater altitudes. The C-47 took the craft to an altitude of 12,000 feet where free flights back to Rogers Dry Lake began.